Poured paper pulp casts of the Mississippi River levee near the lock in Plaquemine, Louisiana. Created with bagasse (sugar cane) and linen rag fibers. After pouring and drying over several days, a desiccated version of the pour is peeled back from the concrete slope. 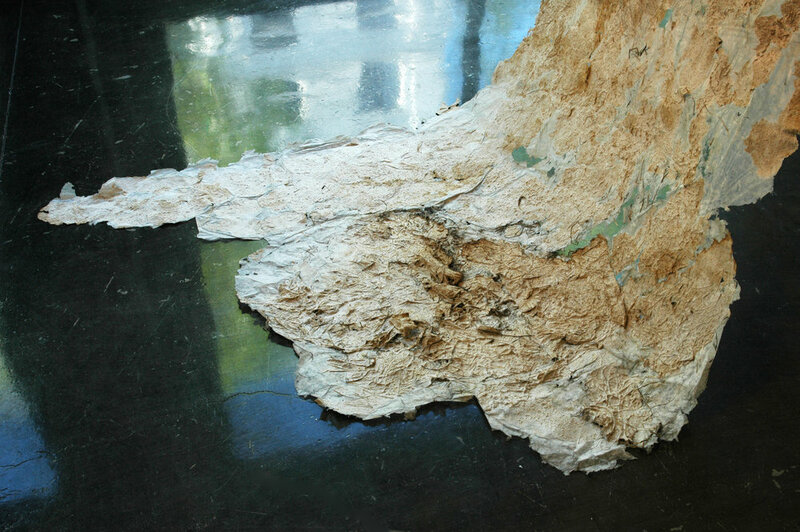 The resulting casts are installed to echo the levee's slope, and the bottom edges of paper drape on the floor, giving one a sense of a space below and above. When light travels through this sheet, all of the ripples, holes and tears of its varied density become alive, glowing with life. Near the bottom, ripped from the levee, are grasses, dirt, stones and tar that the paper cast removed from the site. Casting the levee in Plaquemine, Louisiana.